ExxonMobil has filed a complaint against Russia at the Stockholm arbitration institute claiming it overpaid $500 million in value added tax (VAT) on the Sakahlin-1 project, after the rate was reduced in Russia from 35 percent to 20 percent. The American oil major says its subsidiary Exxon Neftegas paid the extra money during the last six years, Vedomosti reported on Thursday, adding that the US firm has informed the Russian Energy Ministry about the claim. Exxon has been arguing it should pay the 20 percent tax rate for the last five years as the VAT rate was cut in Russia in 2008. Other participants in the Sakhalin-1 project continue to pay VAT at 35 percent based on the original agreement signed in 1995, despite the new rate. As a compromise Exxon has suggested Russia reimburse half of the overpaid tax, and all future VAT payments will be at the current 20 percent rate instead of the historic 35 percent. Russia is also preparing its response and is looking for an out of court settlement, Vedomosti said. The US company is Sakhalin-1’s main operator with a 30 percent stake in the Russian Far East project. Another 30 percent belongs to the Japan’s Sodeco; the Indian ONGC owns a 20 percent stake. In 2013, the project produced 7 million tons of oil, or about 140,000 barrels per day. The CEO of ExxonMobil Rex Tillerson visited Moscow for talks on the matter last month but the parties failed to come to an agreement. Later, Russian Energy Minister Alexander Novak told Vedomosti that the issue of reducing the tax was being considered by the government. Western anti-Russia sanctions forced ExxonMobil to cease offshore operations in the Russian Arctic in September while Russia’s Rosneft and its President Igor Sechin have been put under US and EU sanctions. The provision of oil equipment and services like drilling in deep water projects such as in the Arctic, or shale well drilling was also banned due to the terms of the sanctions. However, in August ExxonMobil and Russia’s Rosneft said they would continue joint exploitation of the Russian Arctic despite Western sanctions. The companies then began exploration drilling in the Kara Sea. 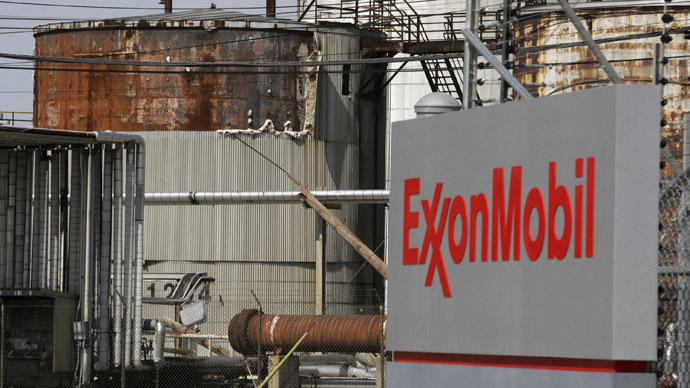 This February, Exxon confirmed $1 billion losses from joint ventures with Russia’s Rosneft. Although Exxon had to suspend development of the Arctic shelf due to the sanctions, the company continued to buy rights to develop Russian oil deposits, boosting its Russian oil assets by 450 percent in 2014.